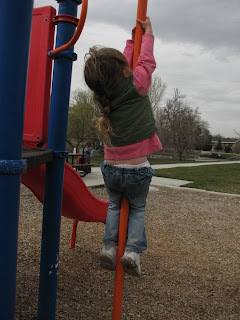 When we were at the neighborhood playground the other day, Madd wanted to slide down the fire pole. So I helped her, and showed her how it works. 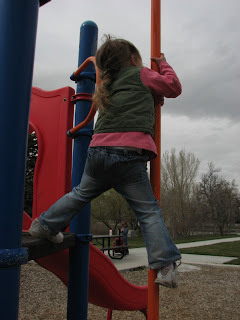 Today at our park we've been visiting (it's close enough that Trev can scoot) she discovered that its playground had one, too. "Aaaah! ", I"m sure she thought, "I know what this is!" 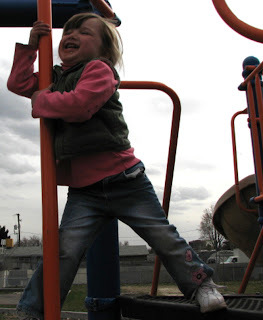 "I wannu swide down de pole!" She told me. Helped with the first one, I did. 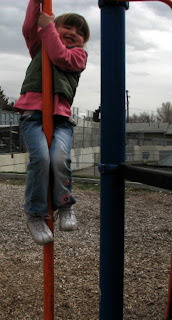 After that, she was down before I could get there. Verra, verra proud was she.